In 2015 University of California Cooperative Extension (UCCE) initiated the UCCE Rice Yield Contest as a pilot study in Butte county. Due to the success of the pilot study, the contest has been expanded to include all of Sacramento Valley. Due to possible yield potential differences, the valley was divided up into 4 regions (1-NE, 2-NW, 3-SW, and 4-SE) using Hwy 20 and the Sacramento River as dividing lines. Harvest and weighing were closely monitored by UCCE personnel. Yields are determined from a minimum of 3 acres from a 10-acre test plot and reported at 14% moisture. In 2017 there were over 20 yield contest entries; however, due to low yields many growers pulled out of the contest and in the end we only measure yield from seven fields in 3 regions. 2017 winners were Rodney Jenkins, Seth Fiack and Kim Gallagher. Rodney, farms near Biggs (NE region) and had the overall highest yields at 115.5 cwt/ac. 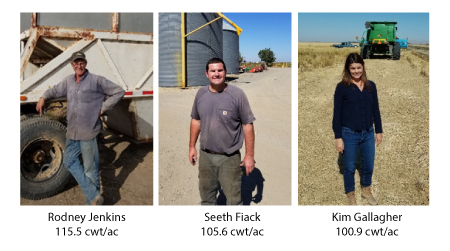 Seth Fiack farms near Glenn (NW region) and achieved a yield of 105.6 cwt/ac and Kim Gallagher farms near Grimes (SE region) and achieved a yield of 100.9 cwt/ac. Interestingly, in all cases the winning fields were planted with the variety M-209. This variety has about a 6 day longer growing duration than the more popular M-206. The yields in the 2017 Yield Contest are lower than in previous years and reflect the overall lower yields experienced by most growers. Overall, lower yields in 2017 are likely due to a late planting date due to late rains and high summer temperatures which shortened the average duration from planting to harvest by about 7 to 10 days. This overall shortening of the growing season due to high temperatures, which speed up crop progression, may be one reason M-209 did well in the Yield Contest. Other factors in 2017 that resulted in lower yields include high nighttime temperatures, severe lodging in many fields, an increase in stem rot, and high armyworm pressure in parts of the valley. In the three years we have run this contest we are learning a number of things. First, high yields are possible from a number of commercial medium grain varieties Winners have included M-105, M-205, M-206 and M-209. Second, yield potential varies from year to year – with 2017 being low. Third, even at high yields, the head rice and milling yields remain good (head rice totals for contest winners ranged from 63 to 68; total milling yields 69 to 72). 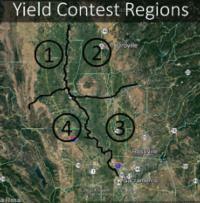 Fourth, high yields are achievable throughout the Sacramento Valley. Finally, to achieve these high yields, fertilizer N rates were average for California and ranged from 150 to 180 lb N/ac. Finally, we would like to thank Ag One Solutions for donating the prize to each of the winners. The prize was a day of aerial mapping services up to 200 acres using a near-infrared sensor or color camera by drone (a prize value of $1050). 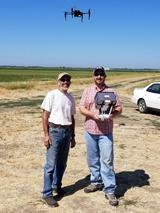 Pictured are Steve Willey (2016 Yield Contest winner) and Scott Gregory (Ag One Solutions) mapping a field near Pleasant Grove, CA.